Do you like Astrix.io? Share it with your friends. Astrix.io is another great multiplayer game from the popular .io games series. 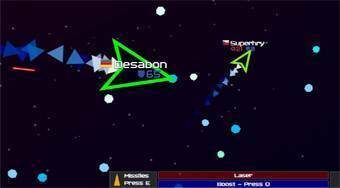 Fly with your space rocket, collect color crystals, and shoot down rockets from other players around the world. For attack, you have laser missiles and devastating missiles.